Pranams and thank you for the wonderful Ganesh Chaturthi Blessings from Sadgurudeva !! Sivaya Gurave Namah !! Sri Guru Datta !! This is the most beautiful video, YOUR voice, the Mantras and the pictures are spreading so much peace, joys and home feeling to me. Thank YOU again and again. Thank you for the wonderful SGG Gift !! Sri Guru Datta !! 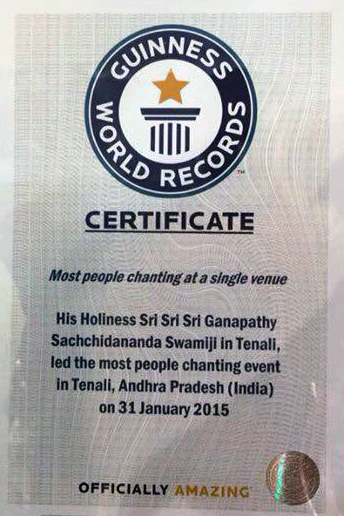 This is a wonderful gift, Swamiji! Very beautiful…. Thank you very much Pujaya Appaji for the Wonderful Memorable Gift to London and the world. Excellent jnana for us,soothing music. Thank you from the bottem of my heart for this so auspicious video of Sri Guru Gita. Guru Gita was always my favorite book and now i am able to watch and listen to it with Gurudeva picturing and speaking , it is such a solace and i feel fullfilled and very gratefull. Jai Guru Dattadeva. Jaya Guru Datta. Appaji, Thank You for this amazing music video. The meaning of Guru and what this means to our lives is explained beautifully. Pranams to your holy lotus feet. No words can accurately describe my experience of watching this video. The tears fell constantly. I was in ecstasy and awestruck at the divine compassion of our precious Sadgurdeva whose greatness is beyond all measure. Appaji, truly your devotees are the most blessed in all the universe to have such a Sadguru as you… Thank you thank you thank you. I bow now and forever at your divine lotus feet, may I never be moved, may You be with me always. Jaya Guru Datta. Sri Guru Datta. Jaya Guru Datta, What a wonderful gift for us all. Powerful, significant and an important interaction when watching Guru Gita. Thank You so much. Sri Guru Gita.